Can I Use Other File Types? To send each subscriber a personalized PDF file, use custom merge tags in your email. 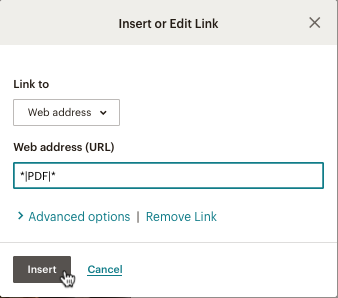 You'll insert PDF file URLs in a Mailchimp audience field, and use that field's merge tag in your campaign. In this article, you'll learn how to set up a new merge tag for PDF links that are tailored to individual subscribers. Familiarize yourself with Mailchimp's Content Manager, merge tags, and methods to update subscriber information. Before you upload your files, save the PDFs with descriptive or numbered file names, so it's easy to match subscribers to their PDFs. This is a multi-step process. You'll need to complete these tasks in order, in three different sections of your Mailchimp account. Upload each subscriber's PDF to Mailchimp's Content Manager. Copy and paste the PDF URLs from the Content Manager into a spreadsheet. 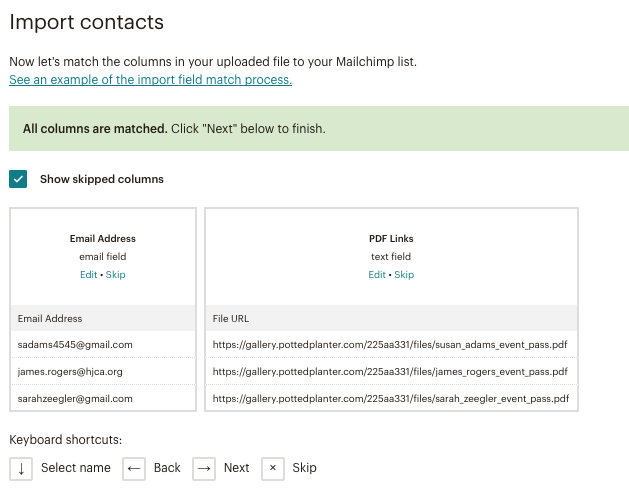 Add a new field to your Mailchimp audience to store your subscribers' PDF links. Update the audience via import to add PDF links from the spreadsheet to the new field. Insert your new audience field's merge tag to your campaign. Test your subscribers' custom PDF links in Preview Mode. To begin, you'll work with Mailchimp's Content Manager, along with a spreadsheet application like Excel or Google Sheets. For this part of the process, you'll upload each subscriber's individual PDF to Mailchimp's Content Manager and paste the PDF links into a spreadsheet file. Later, you'll import this CSV file to a new field in your audience to connect the PDFs to an audience field merge tag. If you have a large number of files to upload and can host the files on your website, skip to step 5 in the following section. To add PDFs to the Content Manager and set up the audience update file, follow these steps. Upload your personalized files into the Content Manager and wait until your uploads are complete. On the Content Manager page, click Copy URL to copy a PDF's URL. Paste the PDF's URL into a spreadsheet file next to the matching contact's email address. Repeat steps 4 and 5 until every subscriber email is matched with a PDF link. Now your update file is ready, and you'll import it to update subscriber information. For this part of the process, you'll work from the Audience tab of your account. 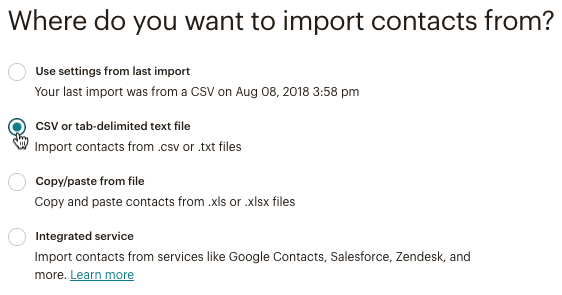 Now that your CSV file is ready, add a new field to your audience and start an auto-update import to add links from the CSV file to the new audience field. Later, this new field's merge tag will be used in the Campaign Builder to insert your contacts' custom links. To add a new audience field and import your PDF URLs into it, follow these steps. Click the Settings drop-down and choose Audience fields and *|MERGE|* tags. Click Add A Field, and choose Text. Input a field label, like PDF Links. Uncheck the Visible box next to the new field so it won't appear on your signup form. In the Put this tag in your content field, input a merge tag name, like PDF. Now your audience has a new field to store your PDF links. In the next step, you'll add your contacts' PDF links to the audience field you created. To add all the links in one large batch through a CSV import, follow these steps. Click the radio button next to CSV or tab-delimited text file, and click Next. Upload your CSV file, and click Next. Match column 1 to the Email Address field and click Save. Match column 2 to your PDF Links field and click Save. After you match and save both columns, click Next to review the import. Check the box next to Update existing contacts. Now each subscriber has a file in the PDF Links field. To complete the process, you'll work in the Campaigns section of the account. Now that each subscriber has a file in the new PDF Links audience field you created, place that field's merge tag into your campaign. When the campaign is sent, we'll replace the merge tag with the personalized PDF link from the audience field. To insert the merge tag into an email campaign, follow these steps. On the Design step, click the content block where you want the personalized URL to appear. Highlight the text you want to link to the personalized file, and click the link icon. In the Insert or Edit link pop-up modal, input your new field's merge tag in the Web Address (URL) field. Type the full merge tag, exactly as it appears in your audience settings. Click Insert to add the link. To test your merge tags, click Enter Preview Mode to open a preview of the campaign. Click Live Merge Info to test your merge tags. When you're satisfied with your campaign, send your campaign or schedule it to go out later. Yes. Follow the same process to send personalized links to any other supported file type. You can also insert personalized image files (jpg, jpe, jpeg, gif, png, or bmp). This is helpful if you want to include a coupon or small, subscriber-specific image in your campaign, without asking subscribers to click a link. The process to insert a personalized image file is similar to the steps to insert a PDF link with a merge tag, with one small difference. In the audience settings, you'll want to add a new image field type instead of a text field. Use an image field's merge tag in your campaign, and we'll replace the merge tag with an image, rather than a link to a file. Mailchimp provides free file hosting. Upload and share files with your contacts without using traditional attachments.